Several studies estimate that power quality issues cost the U.S. economy about $15 billion each year. Because approximately 80 percent of all power-quality problems originate from the customer’s side of the meter, facility owners, managers, designers and other high-tech equipment users need to understand and manage and avoid power quality issues. The blog explains what is Power Quality (PQ), what causes it?, typical symptoms you can recognize and what can you do. A hyper link has also been provided for clients at end of blog about a service from Schneider Electric that can help you manage Power Quality. What is Power Quality and what causes PQ problems? When generating plants create commercial electric power, the voltage is in the form of a 60 hertz (Hz) alternating current (AC). Once service is delivered at the proper voltage, systems you use to distribute electricity within your own facility can affect power reliability. This “end use” quality is called power quality. RMS voltage variations, short or long duration, include sags, swells and interruptions. Sags, the most common type of PQ disturbance, usually last from 4-10 cycles and are generated within the facility, not by the utility. Voltage transients, also known as impulses, are rapid, short-term voltage increases that are categorized as either impulsive (large, short-term waveform deviation) or oscillatory (ringing signal following initial transient). Waveform distortion – Harmonics, interharmonics, and sub-harmonics are mainly caused by phase angle controlled rectifiers and inverters and other static power conversion equipment found in variable frequency drives, PCs, PLCs and other devices employing switching power supplies. Voltage imbalance – In three-phase systems, voltage imbalance occurs when the amplitude and/or phase angles of the three voltage or current waveforms are unequal. According to the DOE, imbalance is probably the leading power quality problem resulting in motor overheating and premature failure. Voltage fluctuation – Sub-harmonics in the range of 1-30Hz result in what is generally called light flicker, an amplitude modulation of the power frequency sine wave. Causes are widespread and include arc furnaces, arc welders, resistance welding machines, lamp dimmers, large electric motors with variable loads, HVAC systems, medical imaging systems and many more. Power frequency variation – When powered by a back-up generator, UPS, or other alternative power source, maintaining voltage and frequency stability during load changes is of concern, along with making sure the transfer mechanism synchronizes the frequency and phase angle before the switch from back-up to the grid is made. Printed circuit board failures in drives, PLCs, industrial PC, etc. Educate: Find out what power-quality standards or guidelines are available. Better understand and learn about power-quality issues. To learn more about current standards reference the Gold Book by IEEE, Recommended Practice for the Design of Reliable Industrial and Commercial Power Systems, IEEE Std 493-1997. Obviously there are several other resources on the web also. Measure: You can’t manage what you can’t measure: Invest in proper technology and services to properly identify these issues. Often, identifying the cause of a power quality problem is like solving a mystery. It is important to get as many clues as possible to reach a conclusion. Having appropriate metering equipment that can log and record power quality issues is an important step in that direction. Nowadays the ability measure and manage Power quality is made easier with Power monitoring software that allows you to capture such information from multiple meters and provides you an aggregate view enabling you to focus your attention on the most critical needs. You may also need to have experts do an onsite survey/ assessment to validate the issues before a recommendation is provided. Manage: Most clients don’t have onsite staff to review, analyze and remedy power quality issues on a very dynamic power system. In case you don’t have expertise or the time, it makes sense to contact your energy management partner for help. Because power systems are so dynamic, continuously monitoring them with periodic assessments can help you optimize your current investment, enable you to respond quickly to power quality events and improve maintenance of life of your investment. It is also important to know that there is a team in Schneider Electric organization called “Power Quality”, part of the Partner Business Unit – EcoBusiness Division – Power Monitoring and Power Quality line of business. This team is offering solutions for Power Quality issues, mainly Power Factor Correction and Harmonic management equipment. A wonderful and educative article. I am in Paris on a business trip and do you have a set up in Islamabad Pakistan. I am retiring as Project Manager from Oil and Gas and an keen to join hands with a reputed co likes yours and promote them in Pakistan. Abdul, thanks for your interest, you may visit our website at http://www.schneider-electric.com/site/home/index.cfm/ae/ and look at current job openings in the career sections. You are right, Power Quality is a growing Customer Concern. 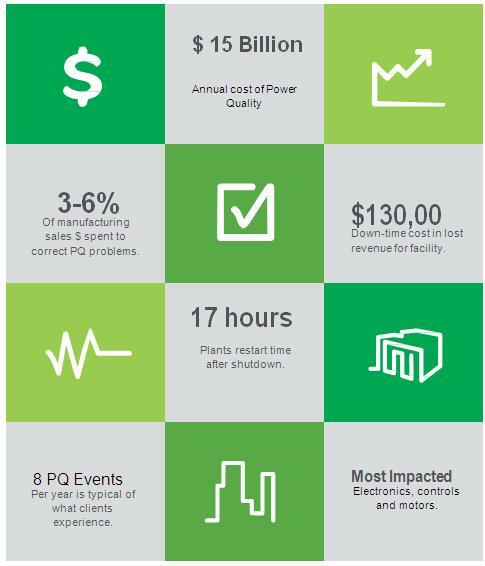 In the Industry Sector, poor Power Quality costs 4% of annual turnover according to LPQI’s survey. Another study (Electric Power and Light Magazine) shows that 30 to 40% of Business Downtime is caused by power quality disturbances! Customers do not have always the necessary skills and experience to manage Power Quality Issues ! The development of Power Quality Services is Key to adress the Customer painpoints. Thanks for sharing the statistics from Industry sector regarding growing impact of power quality issues. as you can review these digital representations. Would I be correct in thinking that the use of a UPS maintains constant output with voltage and frequency. Does it have any effect on harmonics on the input supply.